When making your emergency plans for a special needs family member or friend, it is critical to consider their needs. I have found little information on this issue. During emergencies or times of unrest, a person with “special needs” is often overlooked. Special needs means anyone that requires special assistance to function. This can be physical or mental and can run from people with minor mobility issues to emotional issues (which an emergency most likely will amplify) to terminal illness. There are many conditions that provide daily challenges for the person to live in a normal setting. When anything upsets the normal routines, these challenges can escalate into major issues. Their care will affect the entire family / group and will require everyone’s acceptance. The group will ALL need to pull together to help care for the special needs family / group member. The stress for all members in your group, including the special needs person, will escalate. How much will depend on how everyone handles it. Group members may need to overcome fears or phobias to help this person. The special needs person's care cannot be placed on one or two people and hope that anyone will survive. What do you need to do to get them ready to travel (both physically and mentally)? Are there any special items, food, medications, medical supplies, mobility aids (wheelchairs both manual and electric, scooters etc…) that you need to prepare before the “event” happens? Even the smallest things get magnified during an “event”. Some specialized medications or food may not be available to you during a situation. You need to discuss this with your doctor to identify what the alternatives are. If they have electric wheelchairs and scooters or medical devices, do you have the ability to recharge them? If not, they can quickly become an expensive paperweight or boat anchor. Do you have manual alternatives? When you are making the decision to shelter in place or evacuate, a number of the concerns will be the same. If you make the decision to shelter in place, you need to have evacuation procedures ready in the event the situation deteriorates and you have to leave. If you are going to shelter in place, things may be somewhat simpler if you have the necessary supplies. However, you may be faced with significant challenges in obtaining medications or medically necessary supplies. If possible it is recommended that you stockpile as many medications and supplies as you can. When the decision has been made that you are going to evacuate, the support for the special needs person takes on a whole new dimension. Depending on the person’s condition, evacuation may be the worst or extreme last option. If there is a facility that you trust that can care for the family / group member, that may be an option. Can the facility accept the patient for long term care? Is it a facility that the family member and you trust? Does the facility have adequate communications capability to allow you to keep up-to-date on your family member/friend's situation? What is your fall-back position if the facility fails? And last, will your family member accept being placed into this facility. If you do not have a secure facility, you will have to make decisions regarding the evacuation of the special needs person. Again, you will be faced with significant challenges in obtaining special foods, medications or medically necessary supplies. It is strongly recommended you have the medical records for the person in the event they require medical attention. (This actually applies to all members of your family or group). How do you plan to transport the person? If they can walk, get in and out of your designated BOV (Bug Out Vehicle), great. But what if they cannot? Wheelchair accessible vehicles are available. However, most of them are not 4WD. This has to be taken into account when you are planning your evac routes and bug out locations. Due to the special needs of this person or persons, you need to look for a BOL (Bug Out Location) that has the basic facilities to support them. Will your evac route and the handicap BOV be compatible with each other? Will adequate care/toileting facilities be available or will you have to modify/build what you need. If you elect to go outside prepared facilities and “rough it” in the back country, what will your special needs person require for additional assistance and preparation? Sanitary facilities will have to be prepared that are wheelchair accessible. In soft dirt or snow, this can become a major challenge. Sleeping arrangements: Can you get the wheelchair into the cabin/tent/pop-up/trailer? Challenges of getting that person out of the cabin/tent/pop-up/trailer for a trip to the sanitary facilities in the middle of the night (with the wind/rain/snow blowing and drifting) will provide a significant challenge to the caregiver(s). What are your fall back preparations in the event this family member (or any family member) injures themselves beyond your capabilities to handle? Special needs patients are already dealing with compromised health conditions. Evacuating them out into the wilderness may aggravate the condition into an acute situation requiring hospitalization. 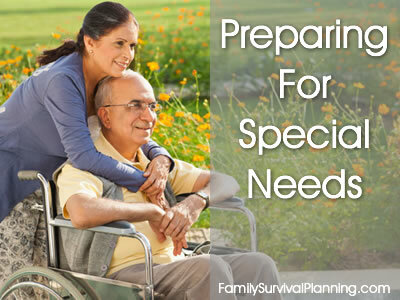 In short, a special needs family member or friend will require significant additional planning. It will be next to impossible for one person to care for a special needs person and handle all of the challenges that will present themselves during an emergency situation. As the situation escalates, the combination of challenges can quickly overcome the ability of that person. Do not wait until the SHTF to start planning. Then it may be too late.